#1 Playstation VR Rental Co. Rent Playstation VR from the most trusted VR rental partner. From cutting-edge equipment and comprehensive event planning to a huge VR experience library and on-site support, we've got you covered. Our Playstation VR experts will take care of everything from equipment to guest experience, so you can focus on other event responsibilities. Is your staff ready to run the VR experience for themselves? We can provide the best equipment to promise your guests a great experience. The Playstation VR (PSVR) is the most popular VR headset on the market today. This popularity is due to the truly amazing virtual reality experience that PSVR provides. Once you put on the headset, you are exposed to a world only limited by your own imagination. As Sony’s major VR headset, the PSVR was designed to provide users with an unbelievable 360˚ viewing area, a huge library of VR content, and an extremely comfortable virtual reality experience. The PS4 VR experience is often recognized as the most well balanced VR option due to its ease of use, top quality content, and innovative headset design. Because of this, Playstation VR has become a go-to event activation with a reputation for delivering amazing guest experiences. 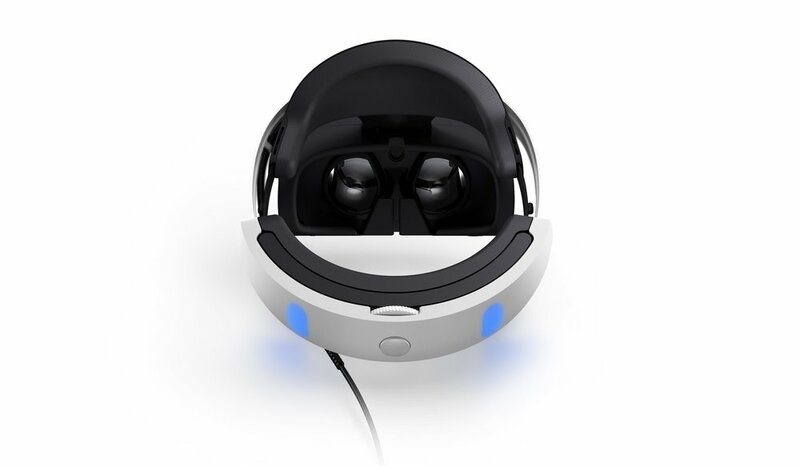 Every PSVR headset contains high quality OLED lenses that allow users to see their virtual environment in it’s entirety through a 100 degree field of view, allowing you to seamlessly look around the VR experience with full immersion. This combined with a 1920 X 1080 screen resolution make PSVR’s lenses more than capable of delivering an engaging VR experience. However, the Playstation VR experience relies on more than just a headset, and while many PSVR titles can be played with the standard Playstation controller, Playstation’s “Move” controllers really kick the experience up a notch. These controllers allow users to interact with objects in their virtual space in a way that no traditional gaming controller can match. Using a color changing sphere located at the top of the controller, the motion of your hands is tracked, giving you the ability to move around the experience as if you are actually there. In order to track the controllers, as well as the headset, a stationary photosensor camera is set up approximately 6 feet away from the user, giving any guest a play space that works for anything from the most relaxed, seated experiences to heart-pumping, exhilarating virtual reality action. Playstation VR’s unique balance of cutting-edge technology, comfort, and array of VR content makes it a top choice for anyone looking to experience virtual reality. Plus, the catalog of PSVR experiences promises only to grow with Sony’s backing and a growing number of VR developers in tow. Bringing the PSVR to your next event will create a one-of-a-kind guest experience that they will never forget, and we want to help you make it happen. "It's innovative, smart and easy-to-use." "feeling like i am actually in these worlds is amazing"